The Eagle Annual Number 1 was launched in 1951 for the year 1952, building on the success of the comic which had been launched in the April of the previous year. I was born too late in the 1950's to enjoy the Eagle Annual when first published, so my introduction to them was as a set of hand-me-down copies from my older cousin Peter. I read them from cover to cover time and time again, then when I thought I had had enough of them I passed them onwards again to another delighted recipient. Over the last few years I have been browsing around numerous second-hand book shops re-creating my collection and also buying the newer volumes which I did not have the first time around. Also I have learned that there were many companion annuals, which I have begun to collect. So, this is my own personal tribute to the Eagle Annual. I hope that by browsing these pages you too can enjoy some of the magic within the pages of these classic boys' and girls' annuals. Reminisce with me by wandering through each of the annuals listed below. Share your reminiscences by sending me them via the Contact Us page. I'll publish the best. Buying and Selling Eagle Annuals. If you're looking for a valuation for your collection, or want to buy or sell your Eagle Annuals then there are many Eagle Annuals for sale on ebay . Why not start your own collection? In the other pages within this website I have divided my collection into sections to make each web page a more managable size. Each of the images in the section pages shows the front cover of the annuals scanned in from the annuals that I own. These front cover images are links to further pages with more information about the annual shown in the link. Within these information pages I've listed a lot of the basic facts about each volume and include a contents list in the style of the original contents list for that volume. In the near future I plan on including extracts from the various annuals, subject to UK copyright laws. Many of these annuals have now lost their fly-sheet covers, so the image is simply the bare material with a small embossed logo in the centre. The Eagle Annual describes itself as Companion to Girl, Swift and Robin. Robin and Swift were aimed at the younger generation. My main interest has been in the Eagle Annual, but I have included information about these companion annuals where I have copies of them. Several Eagle Novels were produced and details of these are included within these pages for each of the novels in my collection. If you're looking for a specific annual or book the site map page might help you find it more quickly. The logo at the top of each page is always a link back to this page. 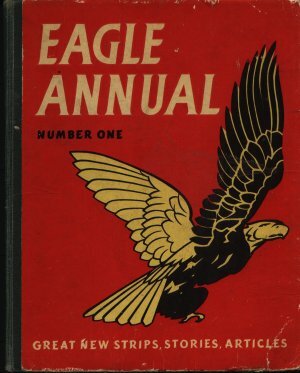 The first series of Eagle Annuals ran from 1952 through to 1975. These are the original and most famous of the Eagle Annuals. Click on the image on the left to go to the First Series page. The second series of Eagle Annuals ran from 1983 through to 1992. Click on the image on the left to go to the Second Series page. Spin-offs from the main series. Dan Dare was a popular feature in the main comics and likewise in the annuals. There were several annuals and novels published dedicated to Dan Dare and also a several runs of books which were reprints of the complete stories as they appeared in the comics. The image on the left is link to the Dan Dare page. Riders of the Range was a radio series that initially produced annuals by special arrangement with Eagle. Eventually, these annuals became fully-fledged Eagle spin-offs. Click on the image to the left to see the Riders of the Range page. The Eagle Comics have been reviewed and remembered in several Best Of annuals over the years. The comic was famous for its cutaway drawings which also have a book and an annual dedicated to their memory. Click on the image on the left to go to the Best Of page. Other closely related specialist annuals and books. Eagle Sports Annuals covered a wide range of sports which were played at the time. Many famous names are mentioned. Click on the image on the left to visit the page dedicated to the Eagle Sports Annuals. Many Eagle publications do not really fit into any of the above categories so they are listed here. Other annuals in this section, such as P.C.49, are for characters that became regulars within the main Eagle Annual. Various novels and picture-strip books, such as the Life Story of Sir Winston Churchill can be found on this page. Click on the image on the left to visit the page dedicated to the various Eagle Books and other miscellaneous Annuals. Eagle Annuals always used to state that they were a Companion to GIRL, SWIFT and ROBIN. Click on the image on the left to see a page listing some of the details and features for the copies of these annuals that I have in my possession. 22/Jan/2012 : Reorganised the contents page to make it easier to find things. A Girl Novel : Wendy and Jinx and the Missing Scientist. A Girl Novel : Belle of the Ballet's Country Holiday. An Eagle Novel : Luck of the Legion. An Eagle Novel : Sergeant Luck Takes Over. An Eagle Novel : Carry On, Sergeant Luck! An Eagle Novel : The Return of Sergeant Luck. A Girl Novel : Belle of the Ballet's Gala Performance.